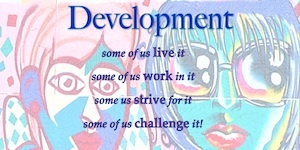 What do we mean by development? This session engaged with critical feminist perspectives of the different constructions and conceptions of development. What these diverse, mainstream and complex understandings of development mean for women’s rights were explored and challenged. A power point presentation shared by Yardena Tankel of the issues raised in the economic toolbox session “Development: some of us live it, some of us work in it, some of us strive for it and some of us challenge it” at the 2012 AWID Forum is included below.